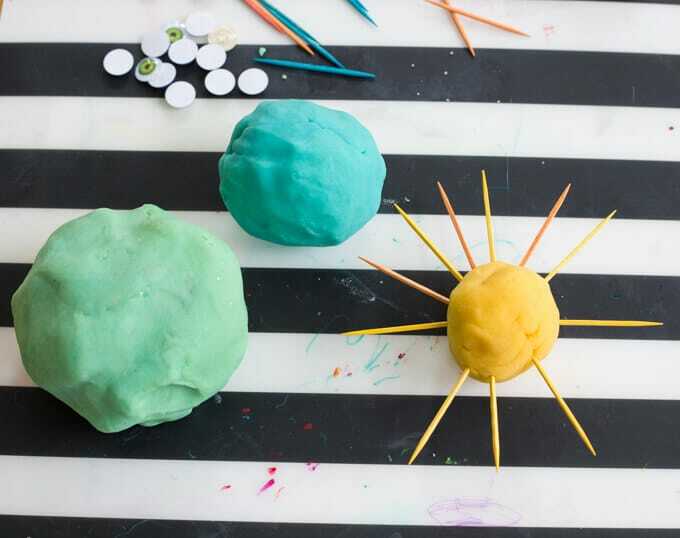 Looking for creative playdough ideas for kids? Here are more than 15 (with a video showing the ideas in action), including making fantastical creatures, using poke-ins, trying playdough mats, forming letters, and pretend play. Playdough is a big-time standby for us and has been since Maia was a toddler. A big batch of homemade playdough will see us through months of making and modeling, pretend play, and pretend cooking. Part creative, part therapeutic, playdough can be used for so much! Here’s a video showing kids playdough ideas in action. Below, I’ll list of different ideas and techniques and then share some of my kids recent playdough play. Playdough can be shaped and molded. And it accepts all kinds of poke-ins and embellishments. We’ve had a lot of snow days lately. During one of them, I set out balls of playdough on the art table while Daphne and her kindergarten classmate, Rose, were catching snowflakes on their tongue and attempting to form snowballs with the limited amount of snow they could scrape up (this was before we got lots of snow). The fifth graders, making icing in the kitchen and then working on homework together, were oblivious, but the younger ones were immediately drawn to the colorful dough, making fantastical creatures, monsters, and birds in nests. While I hadn’t added any poke-ins or tools to the table on purpose (I like to encourage them to interact with the playdough on it’s own, at least sometimes), Daphne requested toothpicks and helped herself to beads and googly eyes. Today, I thought I’d share photos of their creations as well as links to some of our favorite ways to use playdough. And they each made the most colorful snowmen ever. There is so much fun to be had with playdough! What are your children’s favorite playdough ideas or activities? Any new ones here that you’d like to try? Previous Post Why Is Art Important to Families? Right post, right time. For some reason, I’ve never offered many poke-ins with play dough. (Well, I know why — I’m afraid of messing up the poke-in and the play dough. It’s nice to be able to reuse.) But, today was just the right day for it AND I remembered some colored toothpicks that o bought ages ago for a project that never materialized. Thank you for this encouragement! It made our morning much more fun.